Unveiled during the presentation of the Galaxy S10 before MWC 2019, the Galaxy Watch Active was, along with the Galaxy S10e, one of the positive surprises of the Unpacked event this year. Compact, elegant and sporty, Samsung offers a product that looks great. After several weeks spent with it, it was time for a check-up. Here's our complete review. Samsung announced a price of $199.99 or 249 euro for the Galaxy Watch Active. For a simple fitness tracker, that would be way too much, but for a full-fledged smartwatch, the price is more than reasonable. The Galaxy Watch Active is available in black, silver, rose and green and is compatible with different bracelets. Compared to the Galaxy Watch from last year, the new Active version is quite small. The case measures just under 40 millimeters and is 10.5 millimeters thick. This is extraordinary for a smartwatch with heart rate monitor and complete sensor equipment. The well-made case of the Samsung smartwatch takes normal watch straps in a width of 20 millimeters, so you can combine the Galaxy Watch Active with an unlimited array of straps. Without the strap, the sports watch weighs a featherweight 25 grams. With the Samsung straps, it is 46 grams. One of the distinctive features of Samsung watches in recent years has been the rotating bezel, which makes for pleasant operation as you don't always have to fiddle around with the small display. The Galaxy Watch Active doesn't have such a bezel. Here everything is controlled via the touchscreen and the two push buttons on the right side. Too bad , but it may have been necessary to make the watch smaller. Another good point to mention, the Galaxy Watch Active is IP68 certified and is well protected against water and dust. It can withstand up to 5 ATM water pressure and can, therefore, be used by the user during showering, bathing or swimming sessions. Overall, I must admit that Samsung has done a great job in terms of the design. I prefer the round format of the dial to the square format of the Apple Watch for example. The watch will also fit all wrist sizes, and wearing it every day is a pleasure, both at work and during sports sessions. Not surprisingly, it is an AMOLED display that is present on the Galaxy Watch Active. Its 1.1-inch screen with a resolution of 360 x 360 pixels is a success. I regret the rather thick contours around the screen, but I can say that the readability is good in bright environments. The brightness can be adjusted manually, but the automatic control of the default brightness is sufficient. The screen is also sharp enough for all situations. On this last point, the choice of the dial is essential for better readability. Some colors or dials may be worse choices than others. Of course, given its size, we don't expect us to watch movies or TV shows on this. The Galaxy Watch Active runs quickly and navigation in the menus is smooth. Unfortunately, not all smartwatches will be able to offer such fluidity in 2019. Samsung's weapon of choice for software is the in-house operating system Tizen. It doesn't have as many apps as Wear OS, but the most important functions for everyday life are on board. Even though the Tizen watches can be used with all Android smartphones in principle, they feel particularly at home in combination with a Galaxy smartphone and in the cosmos of Samsung services. On the other hand, if you own a smartphone from another brand, the configuration is a real nightmare. You will have to download three different applications and then download an update for the connected watch before you can finally enjoy your new Galaxy Watch Active. This should be a lot easier than it is. The rotating arrangement of the symbols in the menus of the Galaxy Watch Active watch is due to the fact that the current version of Tizen was developed for smartwatches with a rotating bezel, a bezel that this Galaxy Watch Active does not have. Instead, you can navigate through the menus by sliding your finger at the bottom of the screen. This type of navigation is very good, but the bezel is better, it must be said. Fortunately, there are two physical buttons on the side: the top button allows you to go back while the bottom button allows you to access the home page. 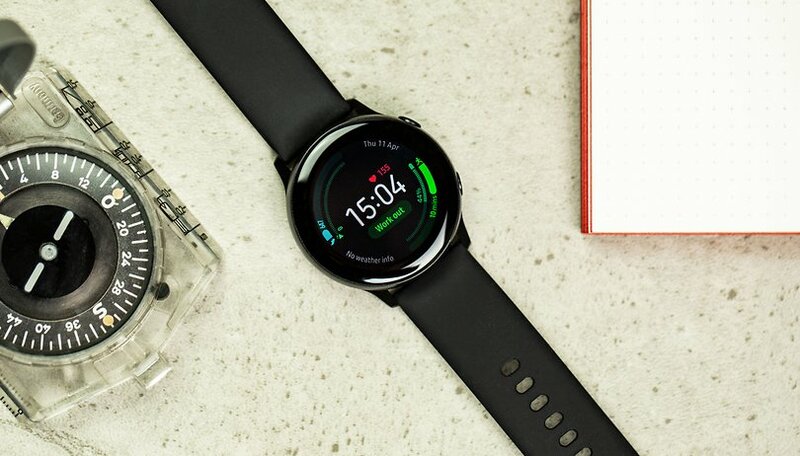 The connected watch works in partnership with the Galaxy Wearable application but also Samsung Health for data tracking. From the first application, you can manage multiple elements such as dials, parameters, vibrations, notifications... etc. Of course, you can receive all of your notifications on your wrist and you can respond directly to many apps, including email applications. It is possible to choose pre-determined sentences or to dictate your answer using the microphone of the connected watch. Personally, I also really liked Google Maps, which allows me to follow the directions from my wrist to the desired destination. Samsung has added a number of new sports features to the Galaxy Watch Active. The watch can record the user's performance in 40 different exercises and automatically detects up to seven different training sessions. The smartwatch can even recognize relatively complex exercises such as burpees. It can also be used for sleep monitoring and optimization. Like most connected watches, the watch encounters some difficulties during swimming sessions to correctly analyze the lengths. All of your data is available in the Samsung Health app. In addition to sports and fitness functions, the smartwatch also has the usual functions such as notifications, calendars, emails and much more. Samsung has improved synchronization with smartphones to make it easier to use. With a simple click on your smartwatch, you can set your smartphone to "Do not disturb" or turn off the alarm clock with a wrist movement. Overall, the experience offered by Tizen is good and the activity monitoring is effective. Reminders to move are also useful and the watch ensures a nice versatility of use, and there is nothing wrong with the synchronization between the smartwatch and the app. This is done quickly and without any problems. In terms of performance, the Exynos 9110 processor coupled with 0.75 GB of RAM and 4 GB of storage are sufficient to provide a more than fluid experience. Without being dramatic, the battery life of the Galaxy Watch is in the average range for smartwatches. Its 230 mAh battery allows it to last a day and a half in the case of intensive use. If the GPS and heart rate monitor are not permanently activated, two days may pass without needing to charge the watch. Charging is done with Samsung's 5W charger or directly via the Galaxy S10 with the Wireless Power Share reverse charging feature. Wireless charging is not what you'd call particularly fast. Allow 2h30 on average to go from 0 to 100%. Wireless charging - how does it work? The Galaxy Watch Active works well and has many practical features. The watch is not only intended for sportsmen and women, but it is above all designed for this type of audience. Those who prefer to wear smaller watches, as most sports watches are quite large and voluminous, will be delighted with this product. If you have larger arms and wrists, you will probably prefer a larger watch or fitness tracker, at least for everyday use. This article was amended on 15 April 2019. Since that day, this has been the final version of our review, but the comments written during the testing period have not been deleted. lol ummmmm, no. there is no competition for the apple watch. nothing comes close. the "best" of the android world is 'at best' a B-. Seriously? No electronic payments? How can that NOT be a typo!?!?!? Samsung made a great product and it has all the essentials for a runner or athlete - Except ONE ESSENTIAL feature. Electronic payments! Returning from a run or a workout I want, no I need, to pickup a gallon of milk or other staple without carrying my smartphone or wallet. With my MS Band 2 just falling apart I need a replacement and was hoping to get a replacement from Samsung that would leverage my Samsung Pay Account I have and use on my phone. Too bad; big miss and a big disappointment to Samsung users - bad move Samsung. Hi John, we checked this out and we have some good news, as well as a mea culpa on our behalf. The Galaxy Watch Active uses Samsung Pay, which isn't available in Germany (where we got our hands-on with the device). But for other markets, including the US, you can use it for electronic payments. We've amended the article to reflect this. Thank you so much for looking into that for me and other international users! Great news! for me! !